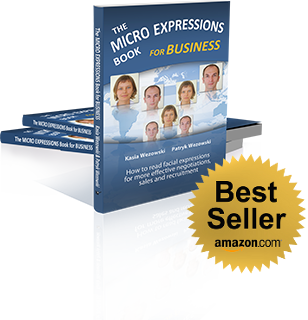 The Micro Expressions Book for Business contains pictures, interpretations and research about the 26 most common variations of 7 Micro Expressions, translated into a practical approach making every business meeting more effective. Kasia and Patryk Wezowski are founders of the Center for Body Language, the World's #1 Body Language Training for Business, with representatives in 15 countries. Would you like to learn more about Micro Expressions? >>> click here to watch our FREE WEBINAR <<<. Imagine that from the first moment of a conversation you can see which emotions a person feels. This person’s facial expressions will reveal you all the necessary information, whether to sign a contract, to offer a different price or to employ this person in your company. If you know also how to use our BLINK Conversation Technique™, you will be able to adjust your words to what you see and become more successful in closing deals. Now think how much time you will save, time you’ve spent before on ineffective conversations with people that weren’t interested. This book on Micro Expressions translates science into the language of entrepreneurs and presents a practical approach how to use body language in business meetings. Being able to read Micro Expressions gives a decisive advantage for everybody involved in sales, recruitment, negotiations, leadership, coaching and training. Kasia Wezowski and Patryk Wezowski founded the Center for Body Language, the World’s #1 Body Language Training for Business, with representatives in 15 countries. Kasia is an optimist, and always finds a creative solution for everything. She believes that successful people usually do what others do only sometimes. She has three Masters’ degrees: psychology, sociology and law. She loves to put theoretical knowledge into practice, running her own companies, training and advising on company strategy for 10 years. Kasia has done over 3000 hours of coaching and trained for many Fortune 500 companies. She loves to inspire people. She has written three books and authored techniques and methods in coping with stress, conflict resolution, creative solutions, effective communication and sales strategies. Patryk is a visionary thinker with original ideas and the drive to see them through. He has a multi-disciplinary approach and a vast knowledge of non-verbal communication, psychology, sales, and internet marketing. He can make any start-up company profitable within six months. Patryk has an amazing ability to read and accurately interpret body language signals. He is also a great speaker. This is the reason why the media ask him to analyse behaviour of politicians and famous people. Patryk also likes to inspire people and is often invited to present to large audiences.